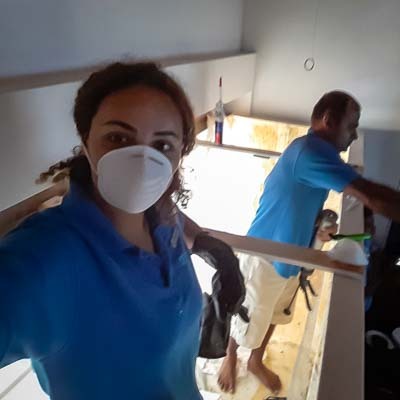 Throughout December and January, we have been very busy refurbishing our large marine aquarium (dimensions: 3.3m x 1.04m x 0.9m, totalling approximately 3 cubic metres (108 cubic feet). 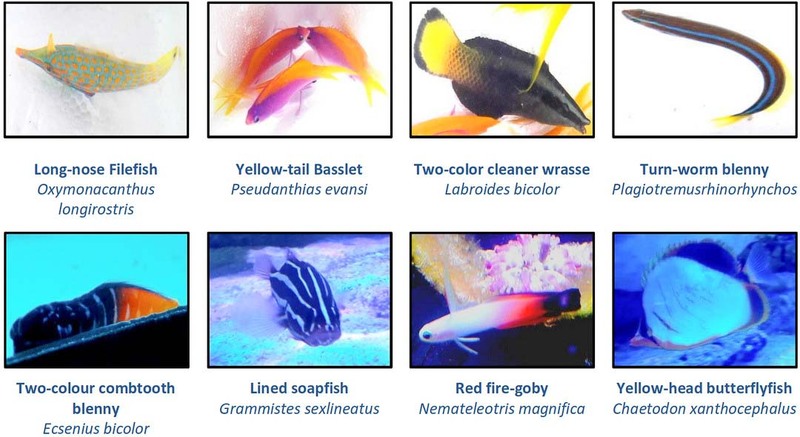 In aquariology, there is a “Fish only” [FO] aquarium and “Reef” aquarium [R] whereas we were developing the more complex “Fish-only with live rocks” aquarium [FOWLR]. 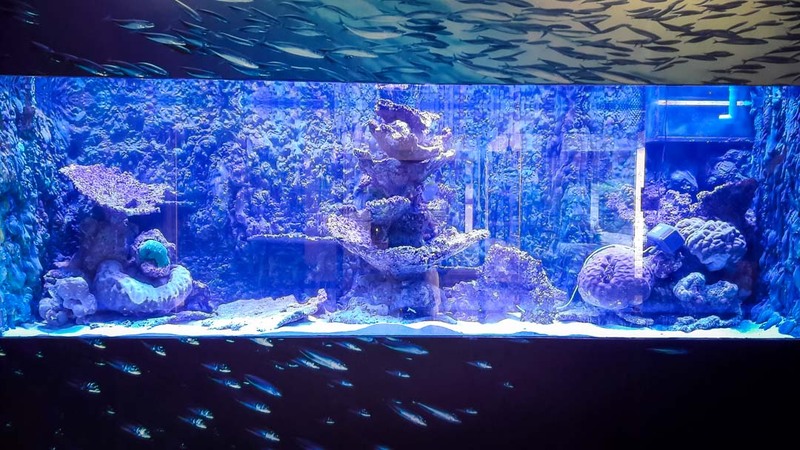 This latter type is designed to showcase fish along with living corals naturally colonised by a variety of marine life (sponges, invertebrates, beneficial nitrifying bacteria). This creates a natural-looking environment and provides excellent supplemental filtration to help maintain a stable eco-system. 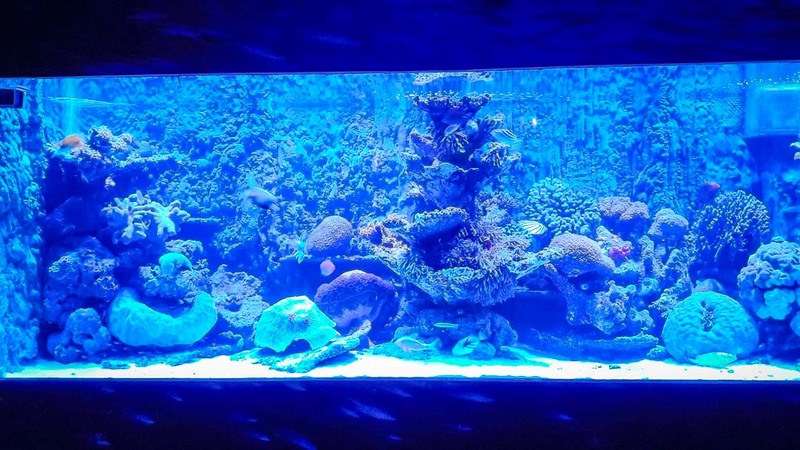 Usually, a FOWLR aquarium does not contain living corals or invertebrates as these may get eaten by the fish, so to prevent this we will be feeding the occupants daily with a variety of foods. polyurethane foam (natural in appearance, durable and lightweight, but expensive and potentially toxic). 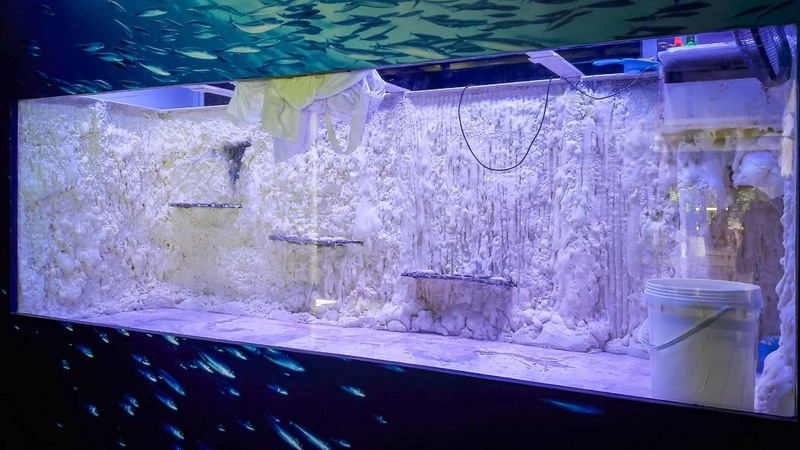 From these potentials materials, we choose to make the background with “polyurethane foam”, which is commonly used in public aquaria (as well as in home furniture). This foam is made from two separate ingredients that harden when mixed together and allowed to dry. Before drying, the foam can be modelled and shaped to cover the walls, hide technical equipment and give a natural appearance. Whilst modelling, we were careful to keep the thickness of the foam to a minimum (<10cm) to allow the maximum space for the fish to swim around. 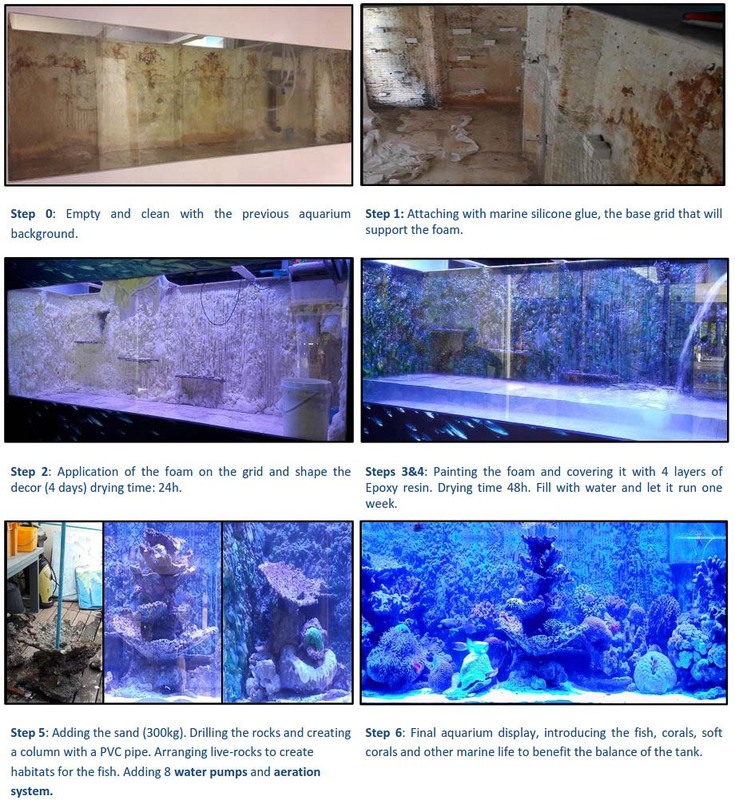 Finally, to neutralise any potential toxicity of the foam, we applied four coats of “Epoxy resin”, commonly used in marine aquaria for waterproofing. The live-rocks were taken from different places of our house reef, and we mainly chose dead coral plates and porous stones. We drilled the coral plates and supported them around a central PVC pipe acting as a supportive column. 300kg of sand was taken directly from the sea to keep its biological benefits. 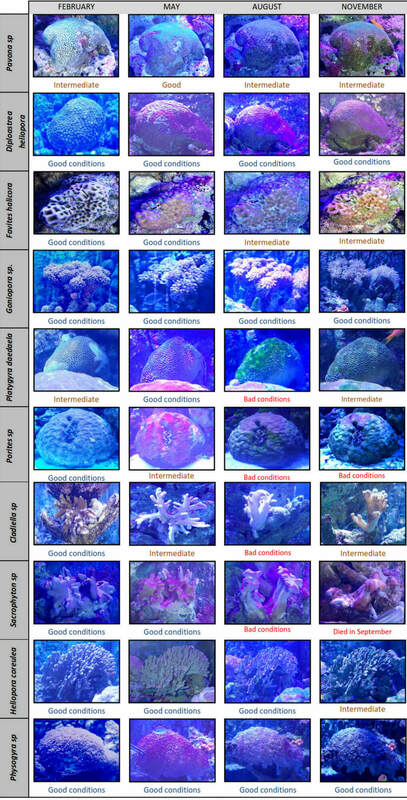 We then added soft and hard varieties of living corals, along with anemones and other marine life beneficial to the ecosystem. 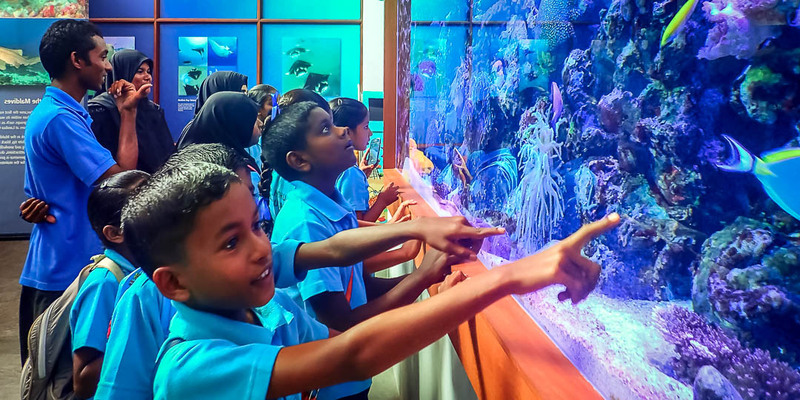 We chose different species of corals, sponges and ascidians, to represent Maldivian biodiversity. Crustaceans, echinoderms and molluscs were also added, to facilitate in the tank cleaning process and help to create a balanced and stable ecosystem. The fish population was carefully selected according to temperament, ability to live together and biological function in the food chain. We avoided carnivorous predators and chose smaller sized fish – a mixture of filter-feeders, detritivores, herbivores and omnivores. Once the fish were caught, we acclimatised them in our turtle pool to become accustomed to dry foods and a closed environment. Aggressive fish and those which did not acclimatise well were returned back to the sea. (As a bonus, having fish in the turtle pools was also beneficial for our rehabilitation turtle residents, as they keep algal growth under control and remove parasites from the turtles). Honeycomb grouper (* bottom right). 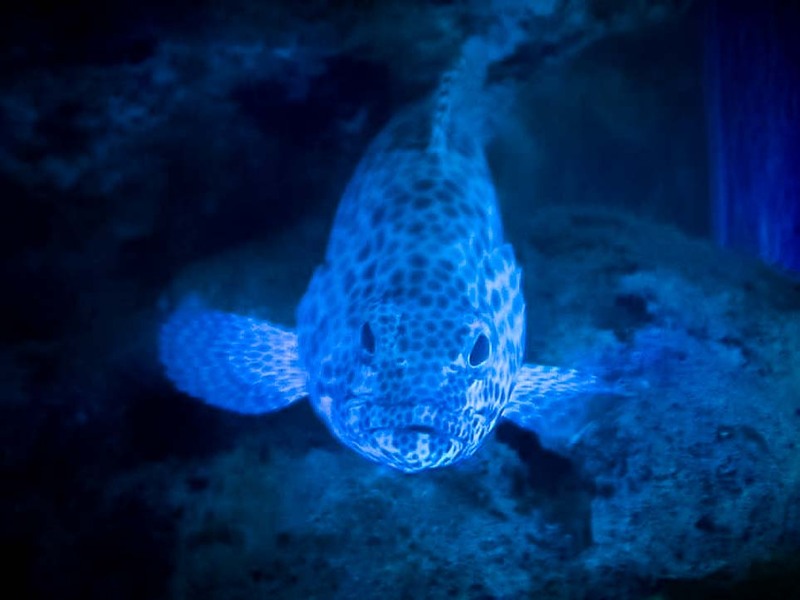 (*) The grouper and the Maori wrasse were released due to their size and predator function. – Acropora species, Cap-like mushroom coral (Halomitra pileus), Porites species, Artistic coral (Platygyra daedalea). – Green Pavona (Pavona maldiviensis), Angular coral (Favites halicora), Sun coral (Diploastrea helipora), Flower-pot coral (Goniopora species). – Bubble coral pearl (Physogyra species), Blue coral (Heliopora coerulea), Mushroom leather coral (Sacrophyton species), Long-lobed cladiella (Cladiella species). – Sea anemone (Heteractis magnifica), Sponge (Acabthella klethra), Red pencil urchin (Phyllacanthus imperialis), Mathae’s sea urchin (Echinometra mathae). – Sea star (Choriaster granulatus), Giant clam (Tridacna squamosa), Sea cucumber (Isostichopus badionotus), hermit crab (Dardanus lagapodes). 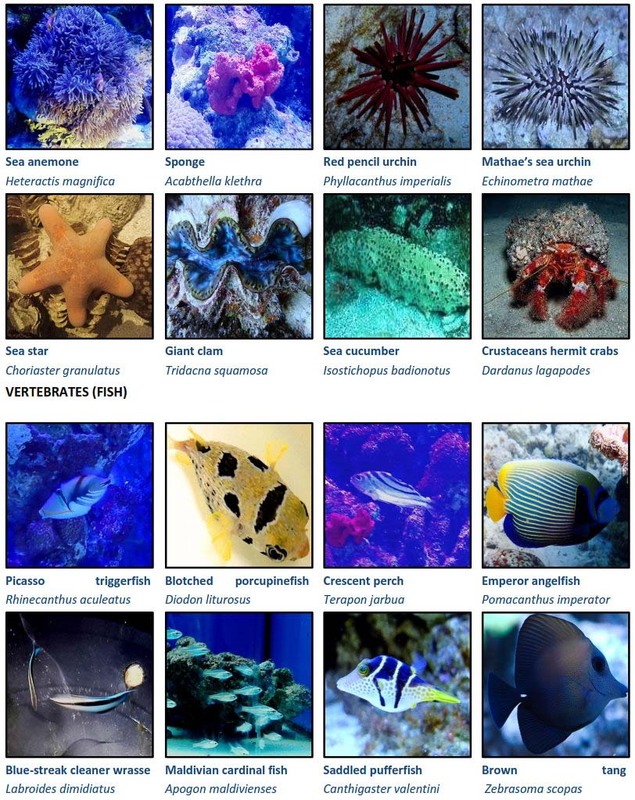 – Picasso triggerfish (Rhinecanthus aculeatus), Blotched porcupinefish (Diodon liturosus), Crescent perch (Terapon jarbua), Emperor angelfish (Pomacanthus imperator). – Blue-streak cleaner wrasse (Labroides dimidiatus), Maldivian cardinal fish (Apogon maldivienses), Saddled pufferfish (Canthigaster valentini), Brown tang (Zebrasoma scopas). 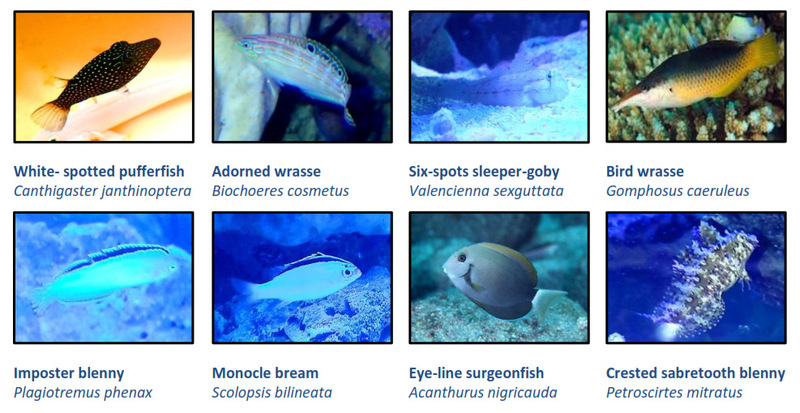 The water parameters are checked daily, and remain safely within the range for the health of our aquarium inhabitants. 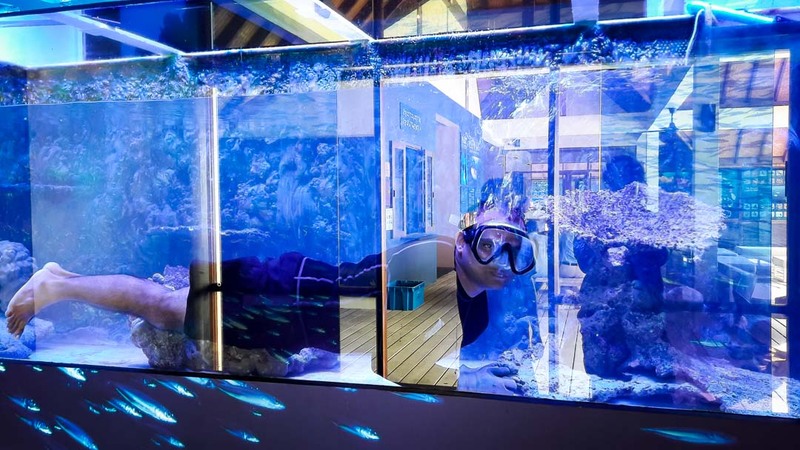 One of the current challenges down in our Fish Lab is maintaining the healthy marine life in our newly renovated aquarium, until conditions have matured and stabilised. The corals in particular require specific water and sunlight conditions, and they are sensitive to pollution, sediments and any water changes. We hold 11 species of hard coral and 4 species of soft corals, and we have been taking photographs every 10 days to assess their health over time. We feed daily with 1L Artemia brine shrimp and have increased the light intensity to encourage photosynthesis by their zooxanthellae. Overall, the hard coral family has shown the best health (e.g. : Diploastrea heliopora, Favites halicora) whereas the soft corals are not faring as well, especially species of Cladiella and Sacrophyton. Throughout March, the coral life in our aquarium remained stable, except for Acropora and Pocillopora species which showed some bleaching. Using a stronger light to increase the activity of their zooxanthellae (which provide 90% of their energy) did not help, so we chose to transplant them onto our coral frames out in the lagoon. The soft corals which were the most affected in January and February have now recovered. Mechanical Filtration (foam, sand, bag): the first step, trapping organic matter particles suspended in the water avoids sedimentation in the tank [we use: 4 sand filters (10μm) followed by 4 ultrafiltration filter bags (5 μm)]. Biological Filtration (ceramic, bio-balls, living stones): bacterial action transforms dissolved organic matter to cycle Nitrogen [we use: living stones inside the tank]. Chemical Filtration (charcoal, zeolite, ultraviolet): to modify the chemical parameters of water. Activated charcoal removes organic dyes; ‘green’ water is sterilised with UV [we use: a UV filter]. 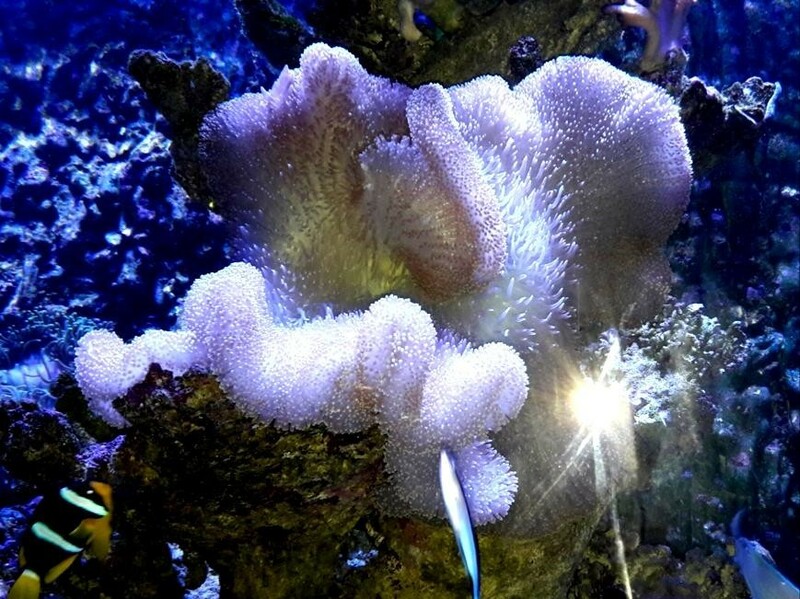 In order to maintain good water quality in the aquarium, we perform regular cleaning tasks ranging from daily backwashing to annual sand filter cleaning. During March, we cleaned 2 of the 4 sand filters. Each filter contains 450kg of sand, and it took 2 full days of hard work to clean all of the sand from just one filter. We also discovered that some fish had made a home in the filters! (The two puffer fish were moved to our aquarium). We recently caught and released our small Honeycomb grouper (Epinephelus merra) after 4 months, as we think this predator was responsible for the disappearance of some of our aquarium’s smaller occupants! In addition, our Porcupine fish (Diodon liturosus) sadly died after 89 days, maybe due to lack of food (we manually feed during the daytime, and this fish is nocturnal). We also noticed our six-spot sleeper gobies were looking skinny, maybe through a lack of nutrients; these limnivorous (mud-eating) fish need a rich soil substrate, so we decided to put more food at the bottom of the tank. Poicilopora (re-introduced last month) is recovering from bleaching. With the help of the water sports team, we caught 57 new fish during three 2-hour fishing excursions. We now have a school of Orange Basslet juveniles and different juvenile wrasse species, known to be peaceful in captivity. Our aquarium volume is 3 cubic metres, so to avoid any oxygen problems (tank anoxia) we are careful not to exceed a total fish biomass of 30 kg. 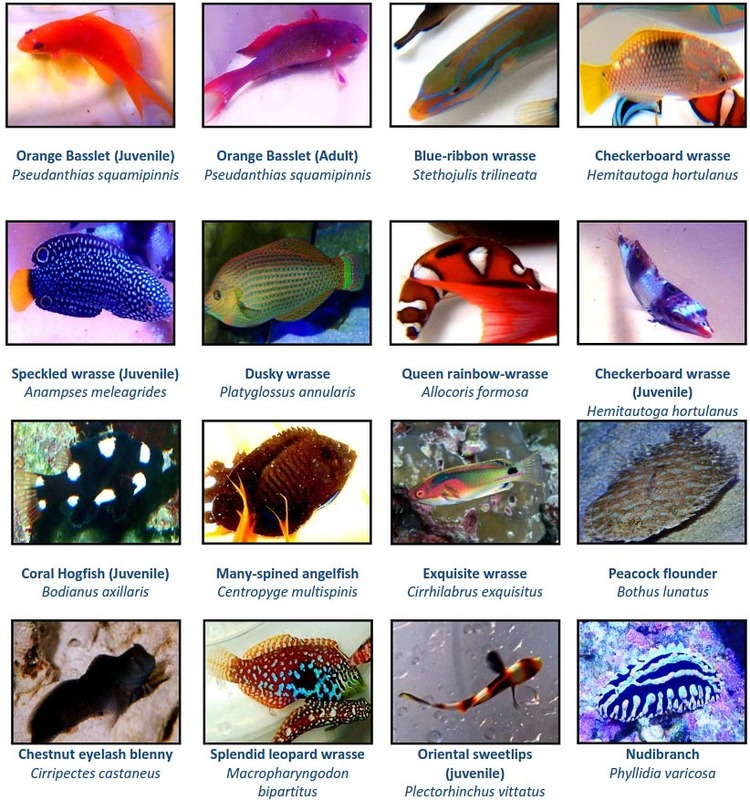 Blue-ribbon wrasse (Stethojulis trilineata), Checkerboard wrasse (Hemitautoga hortulanus), Speckled wrasse (Anampses meleagrides), Dusky wrasse (Platyglossus annularis), Queen rainbow wrasse (Allocoris formosa), Checkerboard wrasse (Hemitautoga hortulanus), Exquisite wrasse (Cirrhilabrus exquisitus), Splendid leopard wrasse (Macropharyngodon bipartitus). 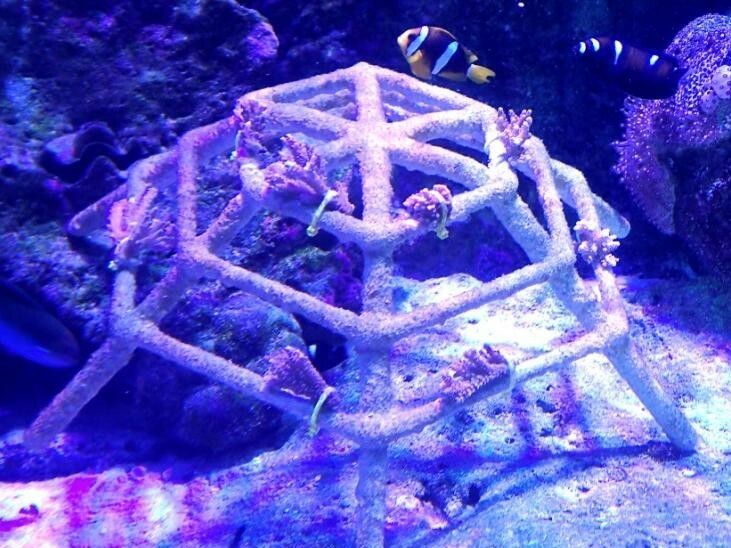 The increased water temperatures recorded in the aquarium during the last three months have negatively affected the coral life. Some of our coral species (Agaridae, Porites, Platygyra) have shown necrosis and algal growth. The newly introduced Pocillopora colony has also developed some algal growth and our bleached Halomitra (Cap Coral) specimen was returned to the ocean. By contrast, the Acropora specimens have been growing well, which is interesting as this species was the most affected by the 2016 coral bleaching event. Disaster has struck! Since July, we have hosted a Merten’s sea anemone (Stichodactyla mertensii), the largest of the carpet anemones, with a folded oral disc that can grow up to a diameter of 1m. The anemones can move and even swim to find their ideal living environment. Unfortunately, our specimen found its way into a water-pump, became stuck and stressed, releasing a defensive mucus into the aquarium water which sadly poisoned most of the fish. In less than 1 hour we lost 90% of our fish population. The Clownfish, which produce a protective mucus against the toxins of the anemone, remained unharmed. So, we have been busy replenishing the aquarium with help from the Kamadhoo fishermen. The new Red sea sailfin tangs and two-colour combtooth blennys are grazers to keep the growth of the filamentous algae under control, which are in competition with the coral life. We also welcomed 8 small herbivorous Zebrasoma; the juveniles are common among staghorn corals in lagoons. To improve the coral cover and to showcase the coral propagation project, we have started an extra-small coral frame inside the main tank with 8 fragments of Acropora. We can closely observe the growth and development of these coral fragments, along with the 5 fragments from February placed around the main tank on dead coral substrate. Throughout October we have been focusing our efforts to reduce the algal development which started last month. The lighting has been adjusted down to 12h/day, and the grazer fish are playing a great role in the control of algae growth. New residents this month include Orange Basslets (Pseudanthias squamipinnis); the juveniles are bright orange while the males turn red. They are primarily filter feeders, so need plenty zooplankton especially during acclimation. – Physogyra bubble coral, known to be hardy for aquaria life, and our existing colony is very healthy and growing well. It is a “near-threatened” species on the IUCN red list. Water parameters of the main tank have remained stable this month, helping to maintain a balanced ecosystem for the welfare of our aquarium’s marine populations. Water temperatures did not exceed 28°C, and our various corals (3 soft and 7 hard coral species) are generally in good health; our new mini-coral frame fragments have taken hold and started to grow. 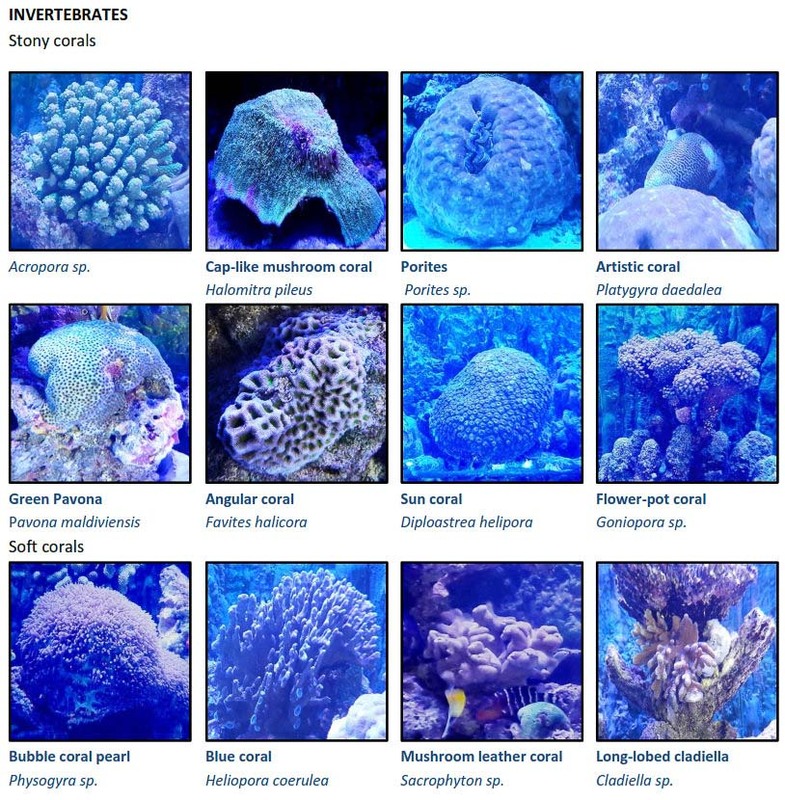 We take regular photographs of our corals to assess health and growth, and hope to identify the species most suitable to be kept and grown in our aquarium. During 2017, we hosted an average 79 individual fish, representing 29 different species from 14 families. The water parameters were generally stable throughout the year, apart from a 2°C increase in April-May, caused by warm intake water from the lagoon which badly affected the corals. It took a further 5 months for the tank to reach a balanced state. soft corals – Heliopora coreulea, Physogyra. hard corals – Pocillopora, Porites. Fish and aquatic animals are directly influenced by the chemical, biological and physical characteristics of their environment. In the ocean, the coral reef environment has the most stable water parameters because of the large volume of water, the presence of currents and the low climatic variations. Compared to an ocean, aquaria have relatively small water volumes, much more susceptible to fluctuations from ideal water parameters. 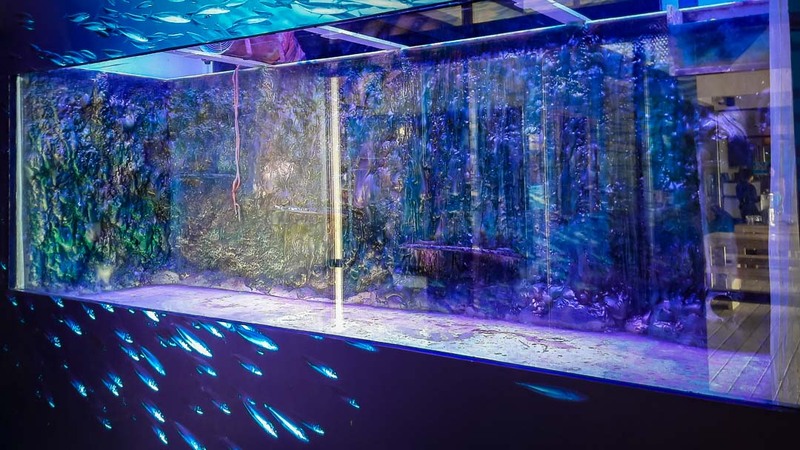 Aside from physical water conditions, changes in the aquatic environment are the result of various biochemical processes and the metabolic activities of all things living in the aquarium which includes fish, invertebrates, algae, and bacteria. Toxicity of some of these chemical accumulations can be lethal, so constant attention must be given to the ideal water conditions. 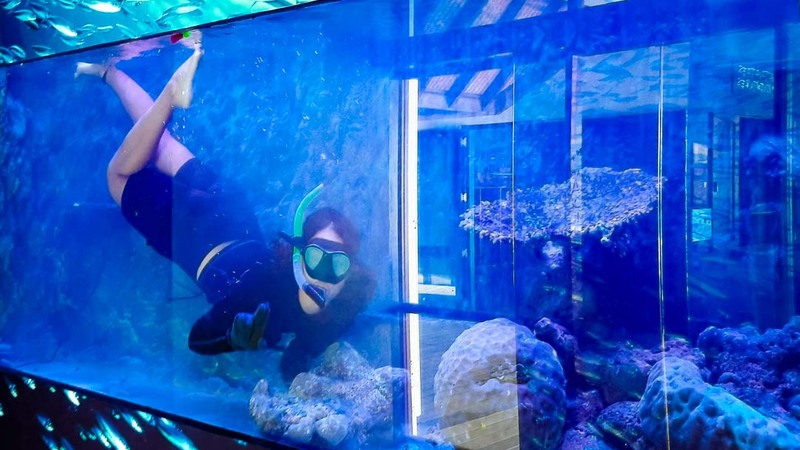 These best practices will lead us to maintain the integrity of the aquarium and experience less stress and better health of the inhabitants. 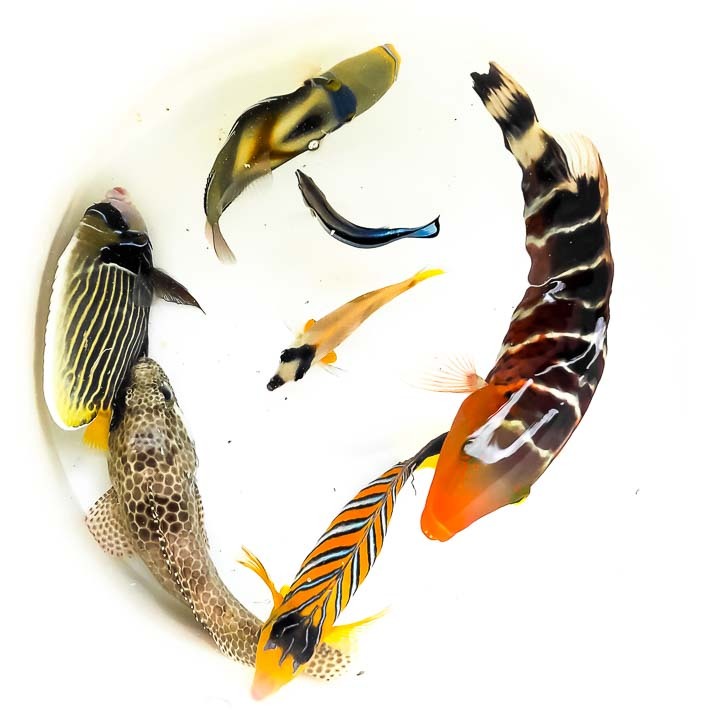 Temperature – since fish and invertebrates are cold-blooded species, they are directly affected by water temperature, which affects their activity, feeding habits, immune system, and other metabolic functions. At higher water temperatures, fish metabolism increases, thus the greater need for food, increasing metabolic wastes which can quickly reach toxic levels. Also, oxygen dissolves less readily in warmer water. Oxygen – Fish and invertebrates need oxygen to respire, as do plants during the night time photosynthesis phase. Water filtration and aeration devices incorporate plenty of dissolved oxygen into the aquarium water. pH is a measure of the acidity or alkalinity of water. ‘Buffers’ are naturally occurring chemicals that can be added to the water to stabilise fluctuations in pH. 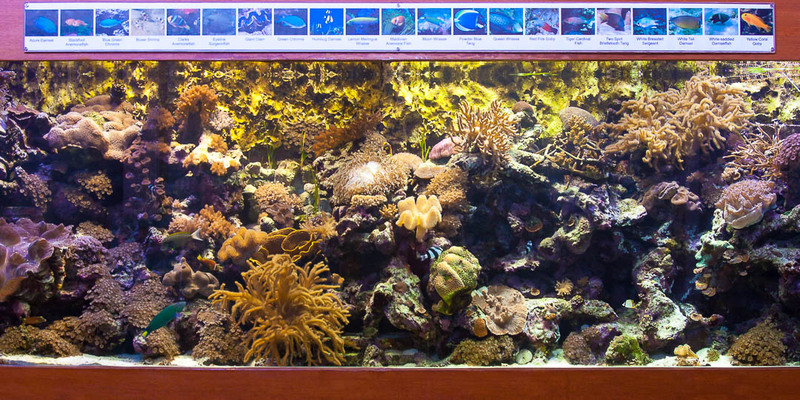 Having the correct pH for the marine life in our aquarium is extremely important to their survival, as it affects vital biological chemical processes. Ammonia is a toxic product formed naturally from biological processes in the aquarium. Ammonia exists in two forms in the water: NH3 (un-ionized) and NH4 (ionized). The proportion of each form is dependent on other parameters, for example, NH3 increases in high pH (more alkaline) environments. Ammonia is naturally broken down by beneficial bacteria into nitrites and then nitrates.